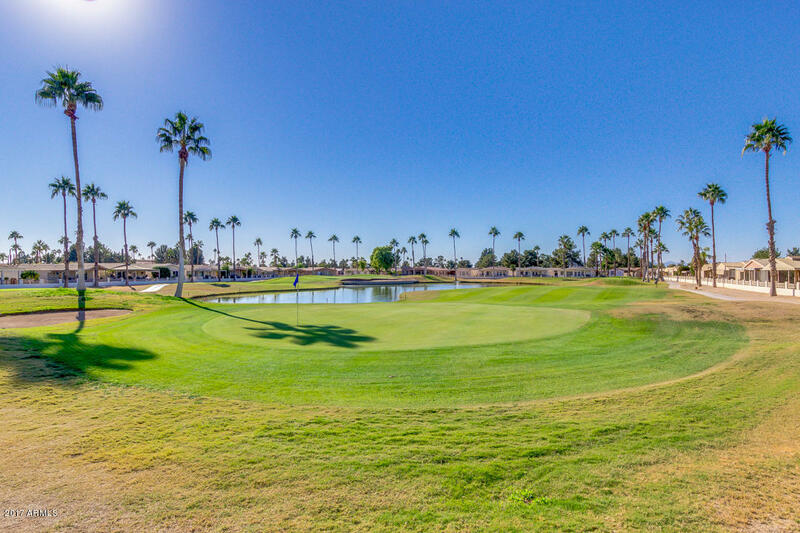 1 Bed, 1 Bath, Golf Course Lot, Water Views in SunBird Golf Resort, Chandler. Enjoy South Facing Patio with Spectacular View of Golf Course, Water & Sunsets. Furniture Included. Updates: Windows, Stucco, Exterior Paint, Covered Patios, Tumble Stone Back Patio, Golf Cart Driveway, Concrete Sidewalk, Privacy Walls, Refrigerator, Bathroom Vanity, Linen Closet, Comfort Height Toilet, Shower Door, Bedroom Vanity, Enlarged Store Shed, Hot Water Heater Shed, Sun Screens, Patio Ceiling Fan & Light. Amenities: Executive Golf Course, Driving Range, 43,000 sqft Clubhouse, 7,600 sqft Ballroom, Restaurant & Bar, Heated Pool & Spa, Health Club, Billiards Room, Tennis, Pickleball, & Bocce Ball Courts, Post Office, Library, Lapidary, Ceramic & Craft Room, Bike/Walking Paths, & Fish Lakes.